Your detailed guide to buying tickets and watching the action at Monza for the 2019 Italian Grand Prix on September 6-8. All images © f1destinations.com. The Editor attended the 2018 Italian Grand Prix. Early-bird discounts of up to 16% apply until January 31, 2019. Early-bird discounts of up to 7% apply until May 31, 2019. Support the ongoing development and improvement of our free Grand Prix travel guides by buying your F1 tickets from our partners, Gootickets. We receive a small commission when you buy using the links on this page. We don’t apply any markup, so you’ll always pay the cheapest price! When it comes to choosing your seat at Monza, there’s a lot of grandstands to choose from, but they are clustered around just a handful of the circuit’s major corners; the opening Prima Variante chicane, Seconda Variante, Variante Ascari and the Parabolica, as well as the Main Straight. General Admission tickets at Monza are also excellent value, despite a lack of elevated viewing areas. Official Ticket Packages from F1 Experiences for the 2019 Italian Grand Prix at Monza include grandstand seats or access to VIP hospitality in the Champions Club and Formula 1 Paddock Club, plus unique exclusive benefits such as F1 driver meet-and-greets and access to the Formula 1 Paddock. You can also add accommodation and circuit transfers to your package. Save up to 16% in the current round of early-bird discounts, which applies until January 31, 2019. We also expect a second round of early-bird discounts (up to approximately 10%) to apply from February 1 to May 31, 2019. All grandstands (plus some General Admission areas) offer big screen viewing. Seven grandstands are permanent, covered structures. The remainder of the grandstands are temporary structures. Children under 11 years of age are granted free General Admission entrance to the circuit, but you will still need to reserve a free ticket when ordering your own. Children’s grandstand tickets (ages 0-11) are mostly priced around €100 for 3-days. Single-day grandstand tickets for Saturday and Sunday are also available. Saturday tickets for the grandstands cost between €100-150. Sunday-only tickets for grandstands are around the same price as 3-day tickets. General Admission tickets cost €50 for Friday, €60 for Saturday and €85 for Sunday (or €90/100 for 3 days). Disabled fans are granted free access to General Admission areas during the whole weekend. Grandstand N25 is reserved for wheelchair users. Monza operates a ‘Free Friday’ policy. If you have a 3-day ticket (General Admission included), you can sit in any grandstand you want, with the exception of the Central Grandstand on the Pit Straight. This is a great opportunity to move around and check out the view from different parts of the track! Eight grandstands are located on the start/finish straight (Rettifilo Tribune) at Monza, ranging in price from the most expensive covered Central stand down to the affordable and great value bleachers. As always with a seat on the pit straight, you will get a great view of the start/finish but little chance of seeing any proper on-track action. For fans on a budget, we recommend the Gradinate bleacher seats on the Main Straight. 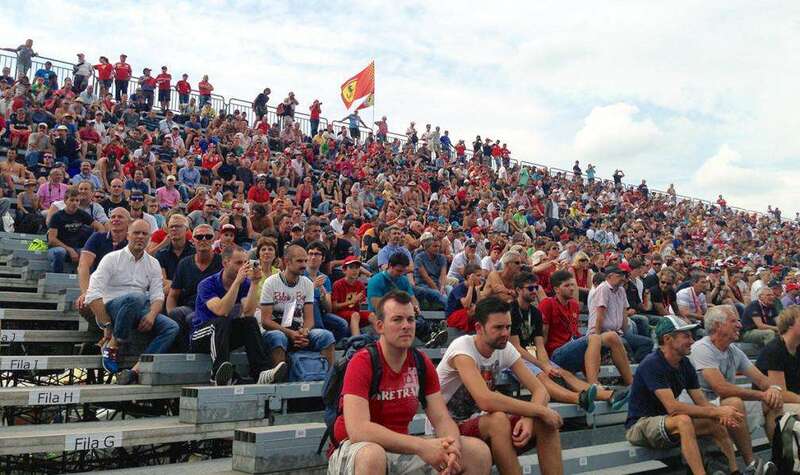 Seats in the large covered Centrale Grandstand (1) are the most expensive at Monza, and are overpriced compared to similar tickets at other Grands Prix. Located on the main straight either side of the Central covered stand are the Left Lateral/Lat Sinistra (4) and Right Laterals/Lat Destra (26A, 26B, 26C). The pricing gives you a good idea of which stands have the best views – the Left Lateral is positioned after the start line, whilst the most expensive Right Lateral grandstand is located closest to the start line. The cheaper Right Laterals are further down the straight towards the exit of the final Curva Parabolica corner. If you want the best view of the after-race podium celebrations, the cheapest Right Lateral grandstand (26c) is the one to choose. All these stands are covered. Also on the main straight is Piscina (5) a cheap standalone grandstand closer to the first corner and near the pitlane exit which we don’t recommend (click here for Piscina video). At the other end of the straight, closer to the Parabolica exit is the covered Vedano (24) which is a better choice, but a little more expensive. Five grandstands are positioned on the opening Prima Variante chicane (also known as Variante del Rettifilo) at Monza. There are three grandstands on the inside of the circuit (Alta Velocita A, B & C) and two grandstands on the outside of the circuit (Esterna Prima Variante A & B). 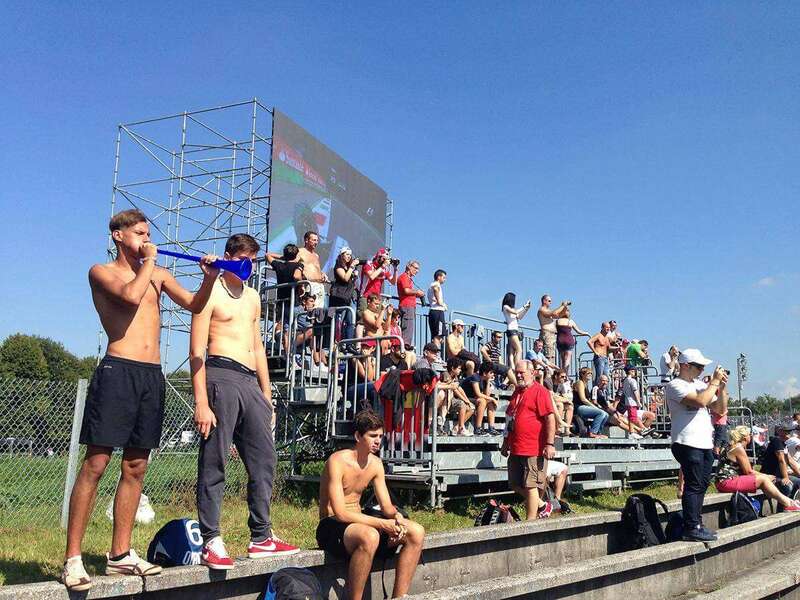 These grandstands offer some of the best viewing at Monza and remain popular, hence the premium prices. The pick of the Alta Velocita stands on the inside of the circuit is Alta Velocita C (6C). As an added bonus, the stand is also located directly behind a section of the old banked Monza circuit. The cheaper Alta Velocita B (6B) and Alta Velocita A (6A) are further from the corner, but still offer decent views. On the outside of the circuit, there is one large grandstand divided into two sections: seats in the more expensive Esterna Prima Variante A (8A) are a little closer to the action than in Esterna Prima Variante B (8B). Also known as Variante della Roggia. 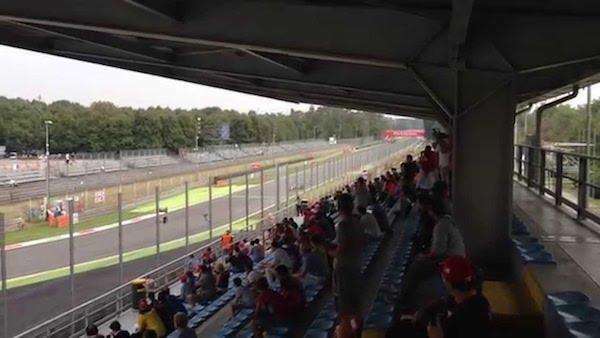 There are two grandstands on the inside of the circuit at Seconda Variante, the third corner at Monza. You will see the cars emerge from the high-speed Curva Grande before braking for the chicane, where good overtaking opportunities exist. Seconda Variante (9) is a better choice than Roggia (10). It’s worth noting that these grandstands are somewhat remote from the rest of the action at Monza. It will take you at least 30 minutes on foot to reach these grandstands from most entrance gates. Eight grandstands are located on the inside of the circuit near Variante Ascari, the high-speed eighth corner at Monza where there are good overtaking opportunities. The best views can be found in the middle of the corner in the Ascari Uno (15) grandstand. Ascari Tre (12) is on the entry and is close to the track, whilst Ascari Due (13) is set back behind the gravel trap in the middle of the corner and Ascari (16) is located on the exit. The Outer Ascari stands (A,B,C) are located on the straight between Variante Ascari and Curva Parabolica: Uscita Ascari B (19) & Uscita Ascari C (20) are small covered grandstand but there are better views for this price. Five temporary and one permanent (covered) grandstand are located on the outside of the circuit on the approach to the final Curva Parabolica at Monza, one of the most famous turns on the current Formula 1 calendar. Tickets in the permanent covered Parabolica (22) stand closest to the corner. The Lateral Parabolic grandstands are priced according to how close to the corner they are: Laterale Parabolica A (21A) is closest to the corner and is a better choice than Laterale Parabolica B (21B) for the same price. In the lower price bracket, Laterale Parabolic C (21C) is a better choice than Laterale Parabolica D (21D) or Laterale Parabolica E (21E). An additional two grandstands are located on the inside of the circuit at the exit of the Parabolica, near the pitlane entrance. There is not much to separate these stands, so the cheaper Parabolica Interna A (23A) is a better choice than Parabolica Interna B (23B). 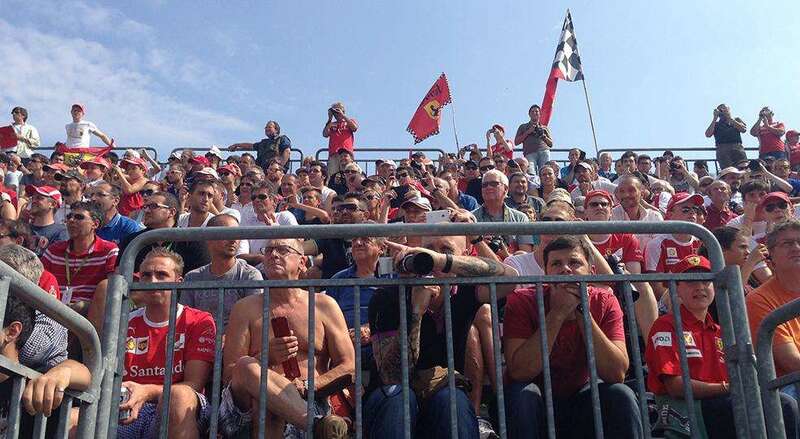 The General Admission offer at Monza is excellent value for money, particularly when you take into account ‘Free Friday’ when you can sit in any grandstand you wish. Provided you are happy to cover a lot of ground on foot over the weekend, it’s possible to get some excellent views of the on-track action at Monza, and the park setting is beautiful. As always, it’s easier to get a good view earlier in the weekend before the tifosi arrive in greater numbers for qualifying and the race itself. There are plenty of small grandstands and raised viewing areas scattered throughout the General Admission areas. No trip to Monza would be complete without a walk through the forest to the furthest part of the circuit to check the view out from the Curve di Lesmo (turns 4 and 5). The General Admission area on the inside of Curva Parabolica is also recommended. Like this guide? Have your own Monza tips? Leave a comment below! congratulations for the great site. That’s right Luca. These tickets are a great deal! 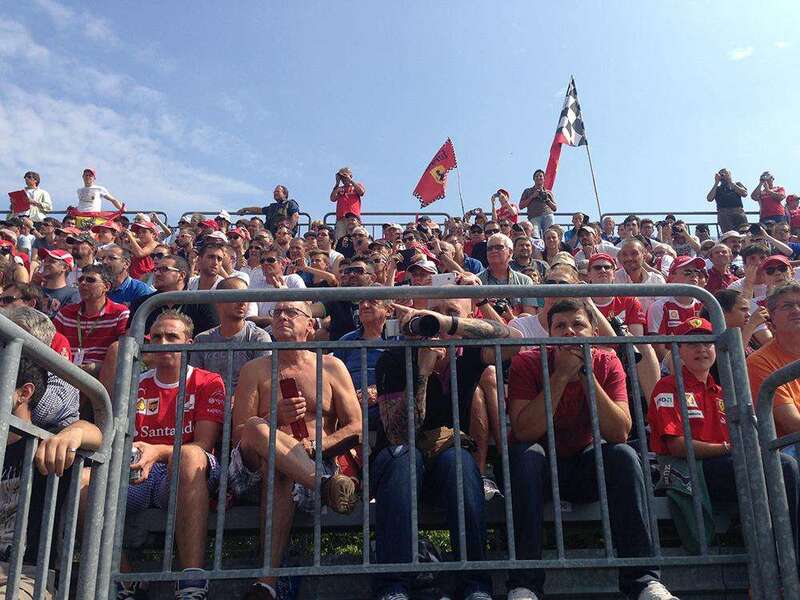 We made the most of Free Friday and sat in pretty much every grandstand at Monza, around 20 in total. Excellent info, thanks! One question, with second variant ticket, can you also access to general admission places? thanks! Yes! All grandstand tickets give you access to the General Admission areas as well. Thankssssssss, and what would say regarding second variant ticket, compare to general admission? if there a good view in general admission to take those curves? Get a second variant ticket if you can afford it, otherwise General Admission is perfectly fine. Don’t forget, you can also sit anywhere you want on Friday. Could you tell me the best way to get to the curcuit from Monza town? I am hoping to get a room there in the next few day’s, We are driving from the UK hoping to stay as close as possable. Check out Monza on Googlemaps and you will see that the park and circuit are right next to the town, so you should be able to walk (or take local buses – see Getting Around for more information.) The bigger issue could be finding a reasonably priced place to stay in Monza itself, as it’s hugely popular on Grand Prix weekend and most rooms get taken by regular visitors or track workers. There’s always trackside camping or staying in Milan and commuting each day, more in Accommodation. I stay on lake Lecco every year. It’s a great location and it’s 15 minutes to Monza by train. The circuit put on buses to The to the track. Hi. Considering going to Monza this year which seat would you recommend for best viewing of the action please? Hi, where are the best areas to get onto the track from the grandstands after the race for the rush to the ceremony. I’m planning on sitting either 26b or 6b. I only know of two many points to enter the track, both on the outside of the circuit. The first is right in front of the podium (end of grandstand 26) and the other is near the finish line (in front of the main grandstand). If you want a good spot in front of the podium, best to go to one of these spots around 5 laps before the end of the race. We did this in 2014, what an experience! i am disabled is it true i dont have to pay for general admission just show my disabled badge? Hi, what time should i arrive to the circuit before the race on sunday? Like i have to be there one hour before the start or when? I am arriving at the airport froman international flight at 10 am, will i have time to check in at the hotel and go to the circuit on sunday? You should try and get there as early as possible! The race starts at 14:00, so it will be hard to get from airport to hotel to circuit in time for the race. I suggest going straight from the airport to the circuit. Hi again, can u tell me how to get from linate airport to monza circuit on race day? Hi Yazan, as you are in a hurry, it may be worth paying for a taxi (not sure of cost, sorry). Alternatively, check google (Milan Linate Airport to Autodromo Nazionale Monza) and there are instructions for taking a bus/train from the airport to the circuit. Thank you for the reply, so do u think taxi is the fastest way? No traffic concerns? Planning to go this year as we will be in Florence, so can shoot up to Milan for the weekend. We are not Ferrari fans but some say the vibe is in any case worth the visit! I hear the track will lose the first Variant / Chicane (Cornes 1 and 2) and will change to a bend for corner 1, and then a new Chicane for corners 2 and 3 nearer the old second Chicane about halfway down the Curve Grande. 2. Which is the best place in the covered grandstands? From this, and other, websites, Stands number 24, 25, 26 and 27 seem the best for views of pre-race grid, pit boxes and post race podium. When do the ticket come on sale for Monza. I am looking for tickets in 6c. Hi Manfred, tickets for 2018 Italian GP will go on sale January 16. We will update our guide straight away after this. Have a good Christmas! Don’t worry Janine, there are no silly questions! You don’t need to buy a General Admission ticket plus Grandstand ticket. It’s one or the other. The benefit of buying a grandstand ticket is that you get to explore the General Admission areas as well! And of course on Friday you can sit wherever you like, even with a General Admission ticket. Enjoy your first F1 experience: you’ve chosen the best track for it in my opinion! Hi David, yes it is. “Admission to the circuit is always free of charge for spectators with disabilities at least 75%, including those with wheelchairs.” More information is here. Can I choose my specific grandstand seat or does it get assigned at random? Looking at one of the Alta Velocita stands but I’d like to sit as far back as possible. Hi, I don’t believe there is any chance at Monza to specify your seat. But if you buy with Gootickets, you can request this and they try to accommodate your request from their allocation. Hello! When buying with Gootickets why are prices lower than on the official F1 ticket site? Część Ewa. Tickets for F1.com are supplied by Platinium Group in Monaco, the same company as Gootickets. However, F1.com applies a markup of around 10-20% to their tickets. We don’t apply a markup, that’s why our tickets are cheaper. Hello! Thank you for the answer. When booking tickets via Gootickets is it possible to send an e-mail afterwards asking for specific seats? Is there an e-mail address I could write to? Excellent article thank you for this information. We’re travelling out and staying at Lake Como as a large family, we’d all like to see the F1 but it doesn’t matter that we’re all there on the same day. Can we get a few weekend tickets and then send different people each day or are the tickets on armbands? Hi Andy, thanks for the kind words. Italian GP tickets are transferable, so different people can use each day of the weekend. Enjoy! That’s great, thank you for the reply. I was planning on buying general admission tickets but as it is the first time we’re going to Monza I’d love to get access to the pit lane. Th ething is that all the packages in the F1 experiences cost a fortune and include a lot of other activities I’m not really interested in. Is it possible to buy my own tickets and get a guided tour around the pit lane for a decent price elsewhere? Hi Natalie, F1 Experiences is the only company that offers guided pit tours on race weekend. You could buy Paddock Club access, but that is more expensive again. If you can stretch your budget, I highly recommend the Trophy package. I did this with some friends at the Malaysian Grand Prix, and it really is a once in a lifetime experience. Thanks a million Andrew. I think you’re probably right! We’re going to Monza for the first time and looking to camp ,been told there’s a camp site c!ose to the first corner (where we have seats) but can’t seem to find where to book. Hi James, check our Accommodation post for Italy. There you have contact details for Camping Autodromo, next to the first corner. Why are the bleachers at the main straight not available? We had these seats last year and they were great. It will be my first grand prix going to Monza and we have general admission tickets. Do you have any advice on the best place to watch where we would get a good view, big screen and a chance to get on track to watch the podium? When does GOOTICKETS ship them to the customer? I paid for mine in March and have not received them yet. I’m leaving for Italy in a little over two weeks. GOOTICKETS keeps telling me I will receive my tickets 2-3 weeks before the race. Well, no tickets yet. They know I’m leaving in ten days for Italy. There is no assurance I will receive my tickets before I travel. They have my money and I have weak promises. You can always call them up and ask to pick up on site if you are worried about not receiving before you leave. We are buying the general admission tickets(fri-sun) 2 adults and child (6years) Monza Gran Prix from http://www.tickets.formula1.com . The child is free? How to add a ticket for a child? Or he don’t need any and just entering with the parents? Hi Darja, it’s cheaper to buy your tickets from Gootickets than from F1 Tickets. General Admission tickets cost 100 EUR instead of 115 EUR. Your child is free, but I think you still need to reserve a free ticket when purchasing. If there is no option, you should be fine entering. I got tickets on Alta Velocita A (6A) and I was wondering which would be the best gate to enter the track area? I guess we will come to Monza from Milan by train and then take shuttle bus. Big thanks for help. Hi Arttu, more information about circuit access is in Getting There and Around post. If you take the Black Shuttle bus from the train station, then the closest gate for entry will be the Main Gate (Ingresso A). Check the map here! After that, it’s around about a 20-30 minute walk to your grandstand, using the tunnel under the circuit. We got our tickets today and we are seated in row 1 at interna ingresso parabolica gf 12. I was wondering how’s the visibility to the track from row 1, is the first row closest or the most further away from the track? And it seems that there is giant tv near us in the parabolica corner, is there any chance we could follow the race from there or should we go for the f1 vision? Hi Mika, normally row 1 is the closest to the track (and lowest). You should be able to follow the action on the big screen, though F1 Access on your smartphone for times etc would be also nice to have. If you have both of these, I don’t think you need F1 Vision. Hi, we bought a child ticket instead of adult for 14 year old boy by mistake, is it possible to get that ticket upgraded to adult ticket ? What are the two small grandstands/bleachers to the right of 6C? Are those general admission areas? We had great seats in 6C several years ago and couldn’t figure out why there were only a few people sitting in those small stands the entire 4 day race weekend. Thanks. Hello Andrew. Can you tell me (approximately) when ticket sale for de Italian Grand Prix 2019 starts? Already big thanks for your quick comment! Hi! I have 3-day tickets for the 2019 race weekend. I’m wondering about the pit walk on Thursday. When does this usually take place? I access this with my 3-day tickets, correct? Trying to book my arrival into Milan. Yes, it is possible. If you are buying with Gootickets, you need to request circuit pick up when completing the transaction. You’ll collect from the “F1 Tickets” booth near the main entrance. I prefer the first corner to Ascari, so I would choose Alta Velocita B. More chance of on-track action here I think. Hi! Bought tickets via monzanet. Got e-tickets, just wondering do italians really know those are real tickets or do I have to chance those for papertickets somewhere. I know that they can be little oldfashioned with this kind of situations;). Off course I have printed those tickets. Given that you have purchased the tickets from the circuit website, you should be fine. I believe there’s an option to swap your E-Ticket for a real paper ticket at the circuit ticket booth near the entrance if you want. I suggest contacting the circuit to ask about this if you want.